Vitamin B5 (pantothenic acid) is needed to form coenzyme-A (CoA), and is critical in the metabolism and synthesis of carbohydrates, proteins, and fats. The vitamin also assists in tissue formation. Helps the body to metabolize carbohydrates, fats and protein. Helps in tissue formation. An antioxidant for the maintenance of good health. Helps in the development and maintenance of bones and cartilage. Pantothenic acid is a B vitamin, namely vitamin B5. Vitamin B5 is used in a variety of functions through your body. Deficiencies are rare, and vitamin B5is typically included in many B‑complex formulations. Deficiency can lead to a variety of ailments. 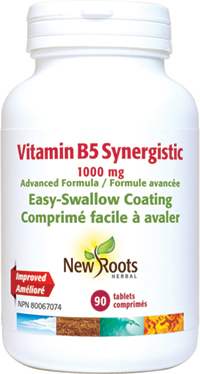 Vitamin B5 Synergistic includes cofactors and other B vitamins to ensure maximum assimilation. Adults: Take 1 tablet daily with food/meal, or as directed by your health-care practitioner. Consult a health-care practitioner for prolonged use. Other ingredients: Microcrystalline cellulose, croscarmellose sodium, vegetable magnesium stearate, and silicon dioxide.